A boy who saved his classmates from an alleged school bus hijacker will be granted Italian citizenship, deputy PM Matteo Salvini has said. Ramy Shehata, 13, raised the alarm on his hidden phone when the driver seized them from other pupils. He and 50 other children escaped the vehicle before it was set alight near Milan. Mr Salvini said the boy should be rewarded with citizenship for his heroics, Ansa news agency reports. "Yes to citizenship for Ramy because it's as if he was my son and he showed he understood the values of this country," Mr Salvini told Ansa. Ramy, whose father immigrated to Italy from Egypt in 2001, was reportedly born in Italy but was never issued with official documentation. Under Italian law, children born to immigrant parents are not eligible for citizenship until they turn 18. Another boy, Adam El Hamami, who is a Morroccan immigrant, also helped raise the alarm by secretly calling the authorities. His father, Khalid El Hamami, said his son should also be granted Italian citizenship. Italian authorities have not commented on whether Adam will also be given an Italian passport. Ramy was told he would be granted citizenship by government officials last week but Mr Salvini, leader of the anti-immigration League party, was reportedly reluctant to make an exception for him. Mr Salvini said backgrounds checks on Ramy's father, Khaled Shehata, were needed before a decision could be made. But speaking on Tuesday, Salvini appeared to change his stance, saying immigration laws "can be overcome" for "acts of skill or courage", Il Fatto Quotidiano reports. Joint-deputy PM and Five Star Movement (M5S) leader Luigi Di Maio said he was "happy" he had convinced Mr Salvini to grant citizenship to Ramy. Government officials have said that Ramy and Adam are among five boys involved in the attack who have been invited to meet Mr Salvini. They also include Fabio, who tried to speak with the terrorist and calm him down and Nicolò, who offered himself as a hostage. The boys were invited as special guests to watch Italy play Liechtenstein in a Euro 2020 qualifier match on Tuesday. Ansa reports that both Adam and Ramy made the call to the police. Ramy was pretending to pray in Arabic - but was in fact issuing a warning to his father. Both boys said on the TV show Che Tempo Che Fa that they want to join the police force when they grow up. The driver, named as 47-year-old Ousseynou Sy, allegedly told the children: "No-one will survive." Police vehicles located the bus and forced it to a stop before the driver, during a stand-off with police, set it on fire, having already doused the vehicle in petrol. Italy's La Repubblica newspaper reports that all the hammers to break glass had been deliberately removed from the vehicle. The children were rescued from the rear windows after they were broken by police. Roberto Manucci, a police officer who helped in the rescue, said: "The thing that struck me most was the children... that will, that strength to save themselves and to get out." Investigators are turning their attention to the driver Ousseynou Sy, an Italian citizen of Senegalese origin. During the hijacking, he reportedly told the captured schoolchildren he was prompted by the deaths of African migrants crossing the sea. A police spokesman also said that during the standoff, he had shouted "stop the deaths at sea, I'll carry out a massacre". Italy's government has taken a hard-line stance against migration from northern Africa, curtailing search and rescue operations. Interior Minister Salvini, a key architect of that policy, has referred to the suspect as "a Senegalese with Italian citizenship" rather than calling him an Italian. 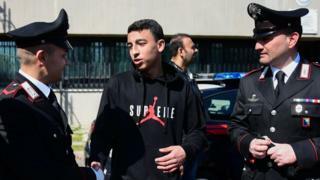 Image caption Ousseynou S told police his actions were a "personal decision"
Alberto Nobili, head of counter-terrorism at the Milan public prosecutor's offices, said the suspect had not linked himself to any banned groups or movements. He told reporters the suspect had said "it was my personal choice, I could no longer see children torn apart by sharks in the Mediterranean Sea, pregnant women dead". Ansa reports that he recorded a video outlining his motives, which investigators are now trying to obtain from a private online account. Officials at Mr Salvini's interior ministry are considering revoking his Italian citizenship. The driver was also known to have a conviction for sexual assault - which resulted in a year-long prison sentence - and a drunk driving conviction, Mr Nobili said. Questions are now being asked about how the suspect became a school bus driver with such pre-existing convictions. Since coming into power in June, Italy's ruling right-wing League party and populist Five Star Movement have established a strong anti-immigration stance. Located at the frontline of migrants crossing the Mediterranean Sea into Europe, Italy has tried to close its ports to boats. On Tuesday, around 50 people were rescued by a charity ship from a rubber boat off the coast of Libya and taken to the island of Lampedusa. Italian authorities ordered that the ship be seized and launched an investigation into the alleged aiding of clandestine immigration. Earlier this month, around 200,000 people attended an anti-racism march in Milan.